A museum in St. Petersburg, Russia, has removed an ancient icon depicting Jesus Christ from display because the piece of art's "energy field" reportedly has killed several staff members. A professor at the Hermitage Museum says he had complained about the effects of the icon for years, reported the London Telegraph. He claims it has led to the death of several supervisors in the facility. The 'killer' icon (Photo: London Telegraph). "It's an inexplicable phenomenon and it started long ago," Boris Sapunov told the paper. "Three or four people died of diseases, and the coincidence began to make me wonder. When the [supervisors'] seats were moved away, all the trouble stopped. It won't be exhibited any more. "The icon was created by several artists, but it is the middle section, painted by an apprentice, that has a negative bio-field." Sapunov claims originally the display only caused minor health problems, like high blood pressure or general malaise. The professor first drew attention to the problem by contacting a Russian tabloid, the Komsomolskaya Pravda. After the publication of a story headlined "Killer icon in the Hermitage," the museum began to receive complaints from worried members of the public. 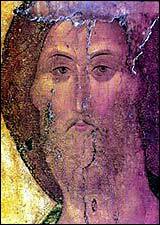 Vyacheslav Gubanov, a local doctor reportedly conducted an analysis of the icon. "This is a wonderful icon, a very powerful one," Gubanov told Russia's Pravda. "It is not guilty of making people feel bad. It produces the power, which makes the human brain vibrate at a high frequency. Not every human being can stand that. Most likely, the icon was meant for the elite, not for common people." Continued Gubanov, "There is no mysticism about it. Everything can be explained with physics. High-frequency signals form the 'biofield' of any living or non-living object, including icons. If someone comes up to it, the icon's radiation sets the frequency of the brain's radiation. The biofield of an icon helps people find a way out of a trouble; the faithful think it is a miracle." Pavel Goskov, a professor of the Altay State Technical University, explained to Pravda experimentation done on icons. "The older the icon, the more power it can produce," Goskov said. "We conducted several experiments with icons. For example, we put a glass of water in front of an icon just for 10 minutes. Then, we poured the charged and the common water into two bowls filled with wheat grains. The result was always the same: The wheat was growing a lot better in the charged water. According to our research, the Holy Trinity icon is the most powerful one. Some people say, they can even sense its power." Some at the museum are unconvinced. "[ Sapunov's] just a nutty professor," Alexandra Kostsova, an icon specialist, was quoted by the Telegraph as saying. "Only one of the workers in contact with the icon died, and she had cancer."